Oh my gosh, it has been so hot this week! Here in Portland it has been a lot hotter than normal, so we are all melting and whining about it. That's what we do, we're pacific northwesters! I've been staying relatively cool, i even installed my air conditioner this week, all by myself! Unfortunately AC or not, come dinner time, my house is sweltering. So we've been struggling to make dinner every night- it's hard to want to cook in hot weather! I've been making lots of hot weather treats, and wether they need cooking or (hopefully) not, I try to get everything I can done in the morning while it's cool, so I can mostly lay in front of the air conditioner in the afternoon. 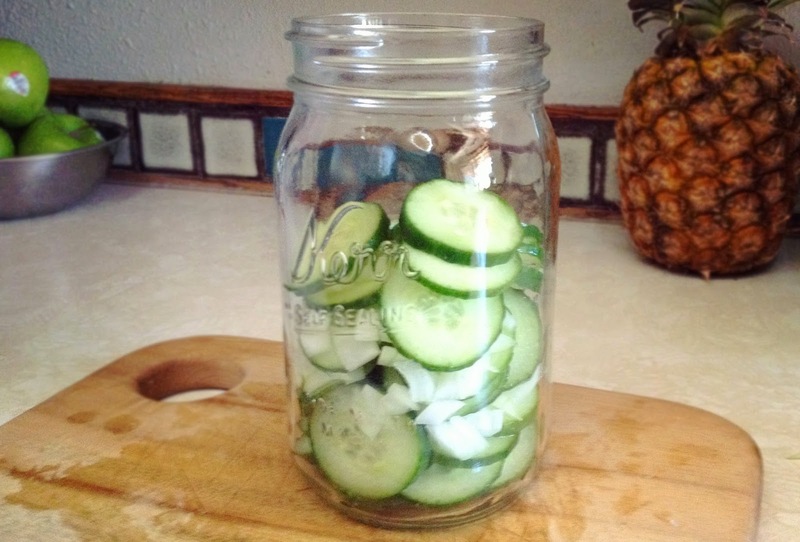 One of the most refreshing things to eat is cucumbers. I love them! Sarah and I love to eat the english ones, straight out of the package, we don't even cut them. They are good like that, but sometimes I crave something a little different. 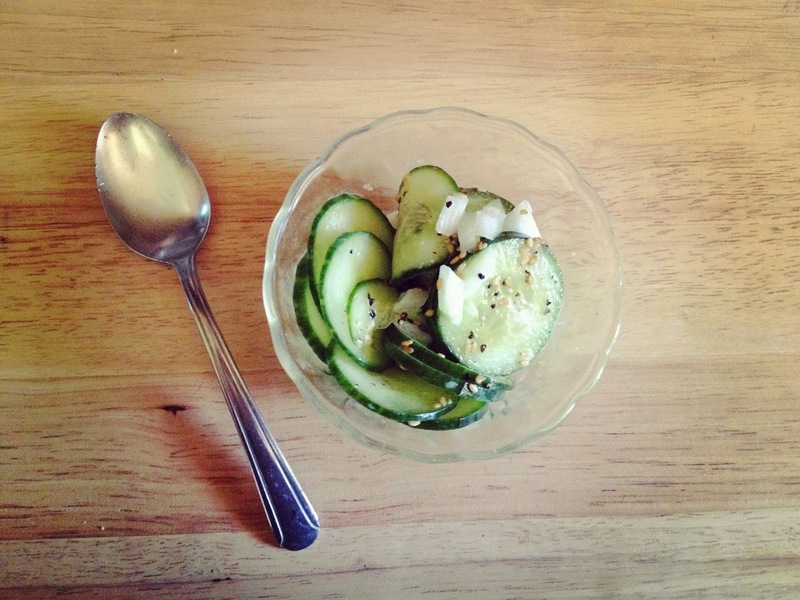 So what I do is throw together a cucumber salad. I call this one "on the fly" because it's something that you can just throw together in a minute. It's so easy. 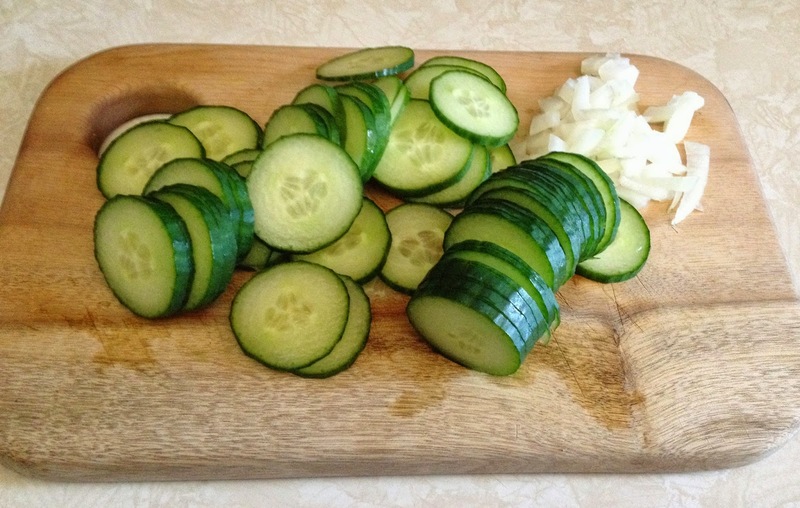 The ingredients are super basic, you start with a cucumber and some onions. Any onions will do, red, white, green, or in my case sweet onions. I prefer sweet onions for eating raw, but if you have red or white onions you can mince them and then let them soak in a bowl of cold water to take out some of the bite. We love onions in our house, so we would probably just toss them in right off the cutting board. For the cucumber, I also have a preference for the english ones. But you could make any cucumber work. If it's not an english cucumber you will need to peel it. English cucumber's have a very thin peel, so I didn't have to bother with that. Slice that sucker into pretty thin medallions, and then toss everything into a jar, or bowl, or ziplock bag. This recipe is versatile! Now we are ready to dress this salad. 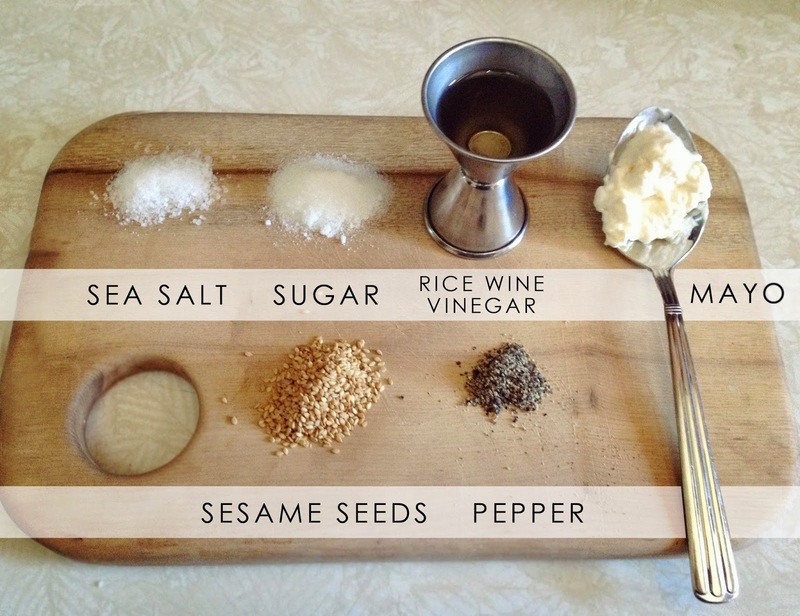 And the ingredients for that are basic too. 1 tbsp sesame seeds, toasted if you would like- I do! Toss everything into a container and mix to combine. Can be eaten right away, or refrigerated until the flavors marry. 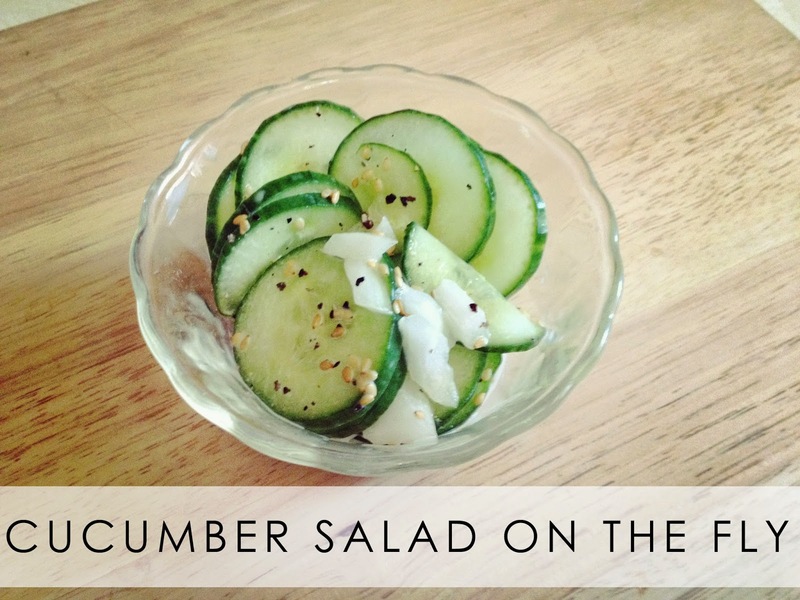 I prefer my cucumbers really crunchy, so I happily eat it right away, but either is good. I would eat it with a fork, the spoon was only for looks. Dairy Free Cupcakes- Straight Outta The Box!